Blue Lotus(Nymphaea caerulea) Lily works euphoric, as an aphrodisiac and heightens awareness. Mild hallucinations occur at higher dosages. 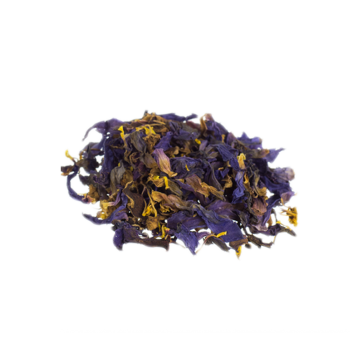 The calming and relaxing effects of the Blue Lotus tea are perfect for a late evenings and after a busy day. When taken before going a sleep it induces vivid and lucid dreams. The Blue lily was a sacred plant for the ancient Egyptians and created day and night. The Blue Lotus gives an narcotic, euphoric, relaxed feeling, while simultaneously heightening your awareness. It used as an aphrodisiac and can induce lucid dreaming. With higher doses of the Nymphaea Caerulea Lily, mild hallucinations and closed eyed visuals can occur! The Nymphaea Caerulea is often used because of it’s great smell, for perfumes and aromatherapy. The psychoactive compounds in Blue Lotus exits out of two alkaloids. The plant contains the psychoactive Nuciferine, an alkaloid associated with dopamine receptor blockade. The other alkaloid is Aporphine which is more common in plants and is a non-selective dopamine agonist. The Sacred Blue Lotus is used in many ways, you can drink it as a tea or as an extraction. Vape or even smoke it. 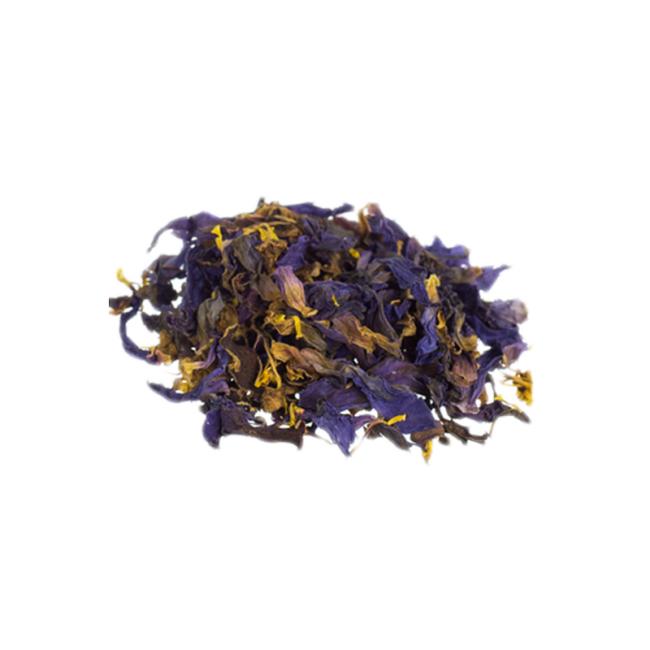 This flower is combined with other herbs, like Damiana , Pink Lotus and Wild Dagga for even more relaxing effects. To make tea of the Blue Lotus use 5 grams of the flower. Add the flower to a cup of hot water, that is just beyond simmering. Soak it for about 5 minutes. Now turn of the heat and let the blue lotus tea steep for 10-15 minutes. Ready is your Blue Lotus Tea. Add cacao, spices or sweetener for that true warming feeling. To extract to alkaloids out of the Blue Lotus and drink the Lily old school way. like the Egyptians. Soak 5-10 grams of the herb in a jar with wine or alcohol. Shake you Blue Lotus Elixir every day and let it sit for 1-3 weeks. Do not put too much of the Sacred Blue flower! The Blue lotus makes the wine bitter and hard to drink. But it is the best and most potent way of extracting the lotus. Additional you can add spices or a sweetener, to mask the taste if needed. The herbs of Blue Lotus can also be vaped with an vaporizer. Use 0.25-0.5g of the Blue Lotus and vape at 100°C to 125°C degrees. The Aporphine alkaloid vaporizes at 125 degrees Celsius. When vaped the Blue lily It is sometimes combined with Damiana Extracts . The Blue Lotus is central to Egyptian mythology, as it symbolizes the sun. The flower closes its petals during the dark night, and opens up again after the sun rises. There is a story in Heliopolis, the city of the Sun, that the world originated with Ra emerging from a lily ,and going back in there every night creating the night. If you want to consume the Blue Lotus like the Egyptians, soak 5 grams of the herb in a bottle of wine for a couple of hours. Do not put too much! The lotus makes the wine bitter and hard to drink. For tea, use 5 grams per cup. Soak it for a while in boiled water. I got very surprised when the effect kicked in. I was not blurred in my perception at all, and I experienced a very potent and pleasant buzz with no mindaltering components. Anyhow it seemed to "balance" my state of mind and an experience of being satisfied in any way I could wish. Do some research and you'll find it has many potentials. I'm definitely not done with exploei the effects of this plant.